One of the questions that keeps coming up in discussions about where network computing is going is the Web vs. Apps controversy. Wired magazine helped kick it off in 2010 with their “Web is Dead” issue. 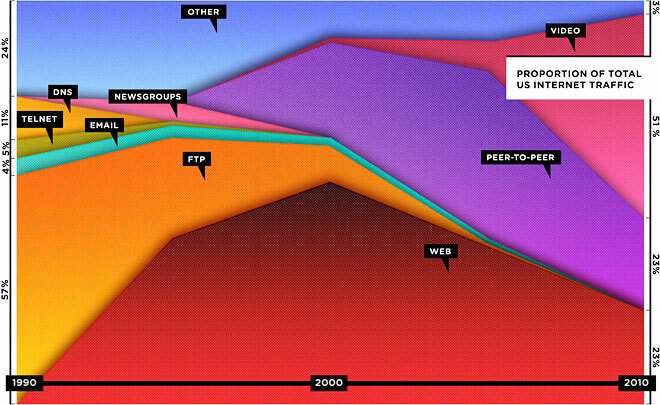 Wired showed a traffic graph highlighting the rise of video traffic on the Internet to a measured level of 51% of the total, not counting P2P. The compelling feature of apps vs. the Web is the user interface. The Web assumes you have a large screen, a keyboard, and a mouse, and its code ensures that your interaction depends on them. Web sites need for you to enter text, they pop up messages as your mouse pointer hovers over links, and they work best when your screen is at least a thousand pixels wide and nearly that many high. As mobile devices take over from stationary ones and high-capacity broadband is everywhere, not only do these user interface assumptions fade away, but the nature of our computing interactions changes as well. Instead of reading a page of canned text or watching a pre-prepared video clip, mobile users interact with each other and with their immediate environment. To do that we need different kinds of user interface elements and different kinds of information access services. When you ask your search service for information while you’re on the move, you don’t want the classic Google link dump, you want a straight answer. All of this leads to the class of applications known as “Augmented Reality” that are about as much like the Web as the Web was like Gopher. I’ll keep playing here while the rest of you flirt with apps. I’ll be here when you come back. I know it’s going to happen. Here’s why. He almost has a point. I’m reluctant to install apps for some web sites that I can get on my iPad because I know that following a link into an app is a one-way journey. But that has more to do with how the iPad works that with any intrinsic feature of apps. They can be object-oriented processors of links, which is to say that clicking on a link in a browser that has an app behind it can take you to the app and allow you to get back. You can do some of this with the multi-touch gestures on the iPad, and it could be much cleaner. The whole process could be voice-driven too. It’s a fairly obvious observation that the future will consist of both pure apps and Web apps; Brent Simmons makes that case as well as anyone. The Web apps of the future won’t look much like the Web apps of today, however. Ultimately they’ll incorporate the advanced user interface elements that are being pioneered by the pure mobile apps. I think the dynamic that’s behind this controversy is the confusion about what the Internet is. For an entire generation, the Internet is indistinguishable from the Web. These are the people who discovered the Internet after the Web was born and who’ve never given any thought to the fact that they use the Web in many cases to access services such as Skype that can and do exist outside the Web.